Chen Shui-bian in October 2008. 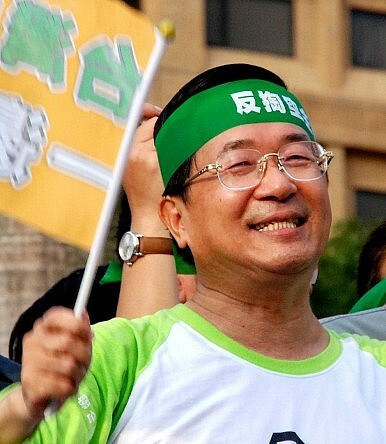 Chen Shui-bian’s temporary release could further complicate Taiwanese politics in the run-up to a presidential election. Former Taiwanese president Chen Shui-bian, the outspoken politician who is serving a 20-year prison sentence for embezzlement and money laundering, was temporarily released on medical bail on January 5 in a move that is sure to complicate the island-nation’s already laden political scene. Chen, who led the Democratic Progressive Party (DPP) to victory in the 2000 elections and ended more than half a century of uninterrupted rule by the Chinese Nationalist Party (KMT), stepped down in 2008 after serving two complete terms. Soon after the election of Ma Ying-jeou of the KMT that year, the authorities targeted Chen for investigation on various charges relating to misuse of funds and corruption. Despite allegations by his supporters that the probe was politically motivated to punish him for standing up to China and being a vocal supporter of Taiwanese independence, Chen was found guilty and received a life sentence in November 2008. He was 60 at the time. In a second trial in 2010, the Taiwan High Court reduced Chen’s sentence to 20 years. He officially began to serve his sentence on November 11, 2010, but by then he had already spent nearly two years behind bars. Various U.S.-based Taiwanese sources who were privy to or involved in the Chen family’s financial transactions have supported the allegations that the former president engaged in corruption during his second term. However, critics have pointed out the double standards in the decision, arguing that KMT officials who have engaged in similar activities were not prosecuted. The revelations against Chen were a major blow to DPP supporters, and the party nearly collapsed after 2008 until Tsai Ing-wen, the defeated presidential candidate in the 2012 elections, took over as chairperson. Taiwanese authorities had come under pressure in recent years to release Chen on compassionate grounds amid reports that his mental and physical health was deteriorating (Chen reportedly attempted to commit suicide in June 2013). Provisions in the Taiwanese legal system permit such a release if it can be demonstrated that an ailing convict will receive better medical treatment at home. Despite the international campaign, which grouped a mix of local and foreign rights activists of uneven qualifications, the Ministry of Justice (MOJ) refused to release Chen on medical parole. However, soon after the KMT’s abysmal showing in the November 29 “nine-in-one” elections, which eventually forced Ma to step down as party chairman, it became clear that a medical parole for Chen was in the offing. Chen’s release was initially scheduled for December 31, but according to the MOJ, “heavy traffic” delayed the delivery of related paperwork and his release from Taichung Prison, approved by a 10-member review panel at the MOJ’s Agency of Corrections, was postponed until January 5. Koo Kuan-min, a former presidential adviser, paid the NT$2 million (US$62,000) bail. Under the conditions of his parole, a group of health experts will convene after one month to determine whether Chen’s health has improved enough for him to return to prison. Ironically, Chen’s release could mean trouble for the party that he formerly led and headaches for Ms. Tsai, who has had to perform a delicate balancing act between supporting Chen and removing the DPP from under his shadow. Corruption aside, Chen was a divisive leader — especially after a very close race in the 2004 elections compelled him to appeal to the “deep green” (hardline pro-independence) segment of Taiwanese politics to secure his re-election. Moreover, although some of his U.S. critics eventually agreed that Washington — busy waging two foreign wars following the September 11, 2001, terror attacks — could perhaps have been “more understanding” of Chen’s position, various foreign governments have complained that the Chen administration often caused them unnecessary trouble, often by breaking its promises or springing surprises. To this day, many foreign capitals remain extremely skeptical of the DPP, despite efforts by Ms. Tsai and her envoys to repair the damaged relationships by promising that no such incidents would occur if the DPP returned to power in 2016. Some officials within the DPP worry that Chen’s release will allow him to involve himself anew in politics, a development that can only but bring the factions within the party into sharper contrast at a time when party unity is essential. It is no secret that some factions within the party would like to see Ms. Tsai, who has adopted a middle-of-the-road position regarding Taiwan’s relations with China, replaced. Interestingly, of the five DPP members (since expelled) who are under investigation for allegedly accepting bribes in return for voting for the KMT candidate in Tainan in the December 25 council speaker elections, three are from Chen’s “one country on each side” (一邊一國) faction. The scandal tarnished the DPP after its stellar performance in the November 29 elections and forced the party to apologize to the public. Ms. Tsai’s apprehensions and those of officials close to her may not be unfounded. Before his release, Chen had already indicated his willingness to grant interviews to the media after being paroled — comments that not unreasonably raised questions as to whether the former president is indeed in such a bad state. Though the conditions set for his release bar him from talking to the media, it is not unlikely that Chen’s son, Chen Chih-chung, who quit the DPP in 2010 but is now trying to rejoin the party, could serve as a porte parole for the former president. Like his father and the disgraced five from Tainan, Chen Jr. is a member of the “one country on each side” faction, which is currently headed by Mark Chen, a 79-year-old former foreign minister. Many hope that Chen will respect the terms of his parole and look after his health. By involving himself in politics, Chen would undermine the DPP’s chances of regaining the confidence of the international community. He would moreover exacerbate factionalism and risk undoing the efforts at modernization that have occurred within the party since he stepped down in 2008. Chen’s presidency wasn’t entirely negative, and many of his accomplishments have arguably not received their due recognition. However, his time and that of his generation has passed, and the greatest contribution he can do for his country in the current context is to stay away from politics.